The Kaufmann Efficiency Ratio, was developed by Perry Kaufmann and determines whether a market is trending or range bound. 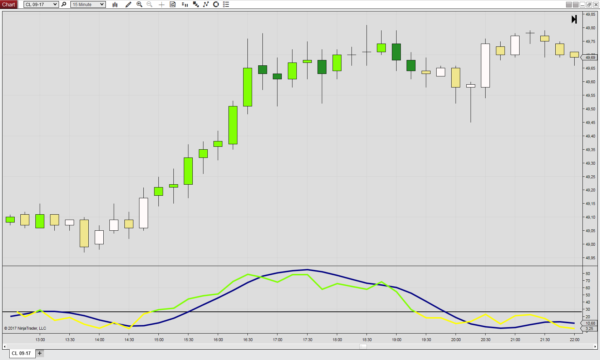 It is therefore an alternative to for example the Directional Movement and the ADX indicators. In a perfect trend, where all bars close in the same direction and do not overlap, the Efficiency Ratio will show a value of 100. A perfect sideways market without momentum in either direction, will show a value of 0. Accordingly, this indicator compares momentum with volatility. Other than the Standard Momentum calculation, one may also choose Balanced Momentum to eliminate the dropout effect. The dropout effect refers to a significant jump seen in the Standard Momentum when the last bar in the lookback period is eliminated. This effect will occur although there’s no significant change in the most recent price action. As the dropout effect can be eliminated by using the Balanced Momentum, the Efficiency Ratio applies it as the default calculation method. The tail end of the N-bar lookback period is then calculated with a triangular Moving Average. A low Efficiency Ratio value indicates a sideways market, whereas higher values a trending market. However, the Efficiency Ratio values will change depending on the lookback period chosen. For example, when using a lookback period of 10 bars, the Efficiency Ratio may show a value of 100. However, when using a lookback period of 100, we will almost certainly never see a perfect Efficiency Ratio of 100. Accordingly, the chop line threshold should be lower for longer lookback periods and this indicator does so automatically. The indicator furthermore has paintbars. Bars above the chopline plot in green or red, bars that plot below are yellow.